On a Saturday morning, we got on a trip to Pattaya from Bangkok. After a few hours of early morning shopping at the Pratunam wholesale market, we arranged for a taxi to take us to Pattaya. As we were pressed for time, we decided to take the hotel taxi offered at 3,000 baht to take us to Pattaya. We left Indra Regent Hotel at about 930am, ready for a Pattaya experience. We planned to spend the whole day there. We prepared an itinerary beforehand, and we had a list of the must-visit places and sights. The trip was a bit long. It took about 2 hours, and we arrived in Pattaya Beach just in time for lunch. There were a lot of restaurants to choose from, and plenty of them were offering European and Thai food at the same time. As we were hungry when we got to Pattaya, our driver took us to the beach side to look for a restaurant. We settled for a simple cafe that served Thai food. The staff were very friendly. They even gave us a free map to guide us in Pattaya, since our driver wasn't too familiar with all of Pattaya's places. 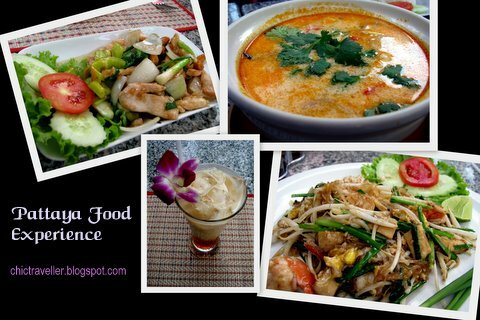 We ordered our favorite Thai dishes -- Pad Thai Noodles, Tom Yum soup, Chicken with Cashew and Thai Milk Tea. The food was very delicious! I swear, no one could go wrong with these dishes in Thailand. People were sitting next to each other under large beach umbrellas. People were pretty much doing their own thing. Those in groups chatted with each other. There were people who read books as they relaxed by their beach chairs. There were some who were getting massages on the sand near the sidewalk. It was pretty crowded! The shore was filled up with all these people that you can barely walk by the shore to get a clear view of Pattaya Beach. The first row of beach chairs were already very near the water, and it was hard to move without passing by people. Seeing this scene dropped my expectations of Pattaya beaches. I hope this doesn't hold true for all of Pattaya beach, since I've only explored one part of Pattaya. I was really very surprised that the beach was so crowded that people could hardly enjoy the sights that Pattaya beach offered. This made me appreciate the Philippines' own set of beaches more. Most of our beach destinations may not be as popular as Pattaya Beach Thailand, but we could definitely get a better experience of the sea and sand as our beaches are not too crowded like this. I visited Phuket and Phi Phi last year and I appreciated our beaches even more. They may have some good marketing/advertising when it comes to promoting their beaches which we don't really have but I can assure you that we have better...way better beaches than them. @dyosa: Marketing really plays a vital role, I guess. We may have better beaches, but they have more tourists coming in. I hope someday we will get to bring in more tourists to the Philippines, seeing that our beaches have a lot more potential to attract more visitors. mitz, the beach is so crowded! eeeek!